The MCA112-05 combines a high output, 119dB(A) alarm sounder with a 5 Joule Xenon strobe beacon. With a robust, fire retardant, IP67 housing, the MCA112-05 is particularly suitable for harsh environments with high ambient noise levels. The sounder & beacon can be operated individually or simultaneously. – Electronic sounder with xenon beacon. -Frequency/Tones: 45 tones, including ISO tones to Australian Standards (see tones table in attached pdf). – Automatic synchronized flash or flip-flop alternating mode (requires sounders to be connected to the same supply). – 3 stage alarm (reverse polarity stage switching on DC units). – Volume control, 122dB Max. – 113dB Min. 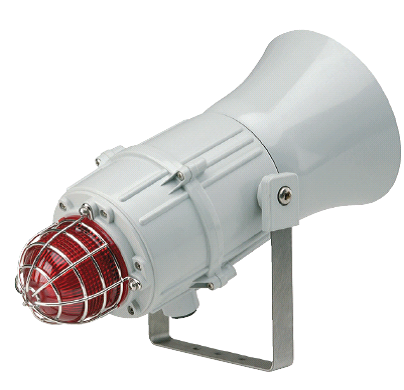 ESS5410 MCA112-05 sounder-beacon, 20-28VDC, 200mA @ 24VDC sounder, 300mA beacon, (specify lens color). ESS5413 MCA112-05 sounder-beacon, 24VAC +/- 10%, 500mA sounder, 350mA beacon, (specify lens color). ESS5415 MCA112-05 sounder-beacon, 42-54VDC, 120mA @ 48VDC sounder, 180mA beacon, (specify lens color). ESS5420 MCA112-05 sounder-beacon, 115VAC +/- 10%, 100mA sounder, 140mA beacon, (specify lens color). ESS5430 MCA112-05 sounder-beacon, 230VAC +/- 10%, 60mA sounder, 55mA beacon, (specify lens color).